For the most part, the go-to battery used in drones is a lithium polymer battery (LiPo for short). Most LiPo batteries are not a true lithium polymer batteries but rather a hybrid between two battery technologies. First and foremost, batteries use chemical reactions to produce electricity. A true lithium polymer battery creates electricity with a chemical reaction between dry components. Unfortunately, this doesn’t create electrical current at a rate that is necessary for drone motors. So drones use a hybrid battery that combines wet and dry chemicals to facilitate the reaction at the rate necessary to power high-energy consumers such as drones. LiPo batteries are ideal for drones because they can be built in many shapes and sizes, they have a favorable size to power ratio, and they have a high energy discharge rate which is ideal for electric motors. But for all of their benefits for use in drones, LiPo batteries are still very dangerous if not cared for correctly. The most common way to damage a LiPo battery is by overcharging it. Overcharging a battery can cause your battery to swell. Swollen batteries can catch fire and explode. Over-discharging your battery can also cause issues if it remains un-charged long enough. The battery chemicals can come out of solution and cause the battery to short when you attempt to charge it again. A LiPo battery that is shorting out internally can explode and catch fire. Bury swollen LiPo batteries in a bucket of sand. Most drones come with proprietary battery shapes and connectors. This is probably more of a function of commerce than safety, but regardless, use only the charges designated for your drone’s batteries. If you buy an aftermarket charger, be sure to read your drone’s manual to ensure that your charger has all the proper safety mechanisms to ensure you never overcharge. Never leave your battery on a charger if you don’t intend to monitor its progress. If your charger’s shutoff feature fails, you could end up with a problem on your hands. LiPo batteries are also very fragile. So fragile that simply dropping a LiPo battery on the floor can damage a cell and cause the chemicals within the battery to react uncontrollably. If your drone is involved in a crash, you will want to ensure that the battery did not withstand any damage. Placing a damaged battery on the charger can result in a fire. LiPo batteries are typically considered to be beyond usable life once they degrade to about 20 percent of their original capacity. At this point, you should stop flying with the battery as it may fully discharge before you can safely land your drone. LiPo batteries can’t simply be thrown away in the garbage can. While they may not be fit to fly, they can still be quite dangerous. Before throwing your battery away, you must first completely discharge the electrical charge. Most chargers come with a discharge feature that will drain the power from the battery rendering it fit for the garbage can. If your battery is damaged or swollen, you still need to discharge the battery before tossing it out. You should not put it back onto the charger to discharge it. 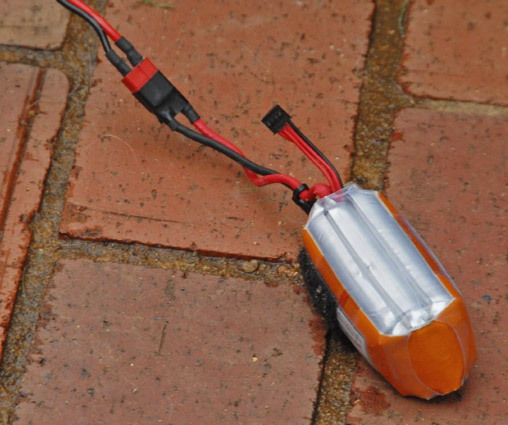 A common way for discharging damaged LiPo batteries involves connecting it to a light bulb and burying the battery in a bucket of sand until it is fully discharged. The safest option, however, would be to take it to your local hobby shop and let the experts dispose of it. If you can’t get to a hobby shop right away, put the damaged battery into a bucket of sand until you can get to one.